Coface Arena is the home stadium of Bundesliga side Mainz and features a capacity of 34,034 with 19,700 of spectators seated. 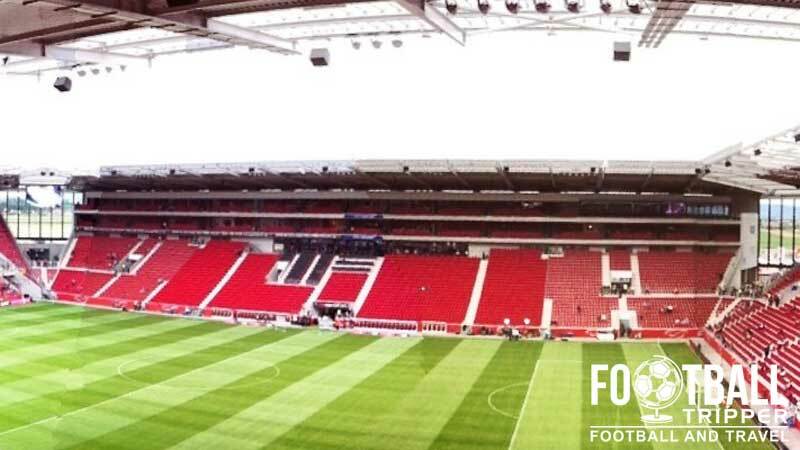 Coface replaces the Stadion am Bruchweg with a designed said to resemble the traditional English football stands such as the Kop and the Stretford end with their high stands. The Coface Arena is one of the newest stadiums in the Bundesliga having officially opened on 3rd July 2011 with a preseason tournament occurring a few weeks later between Borussia Dortmund, Hamburger SV, FC Bayern Munich and the home side Mainz. Construction took place over a 22 month period with the ground being broke on May 2009, but the seeds were sown way back in 2007 when the club’s management identified a new stadium was imperative to remaining economically competitive in the Bundesliga. The club scrutinised the placement of the new stadium with the three most feasible options as follows: building on the site of the former Bruchwegstadion within the Hartberg-Munchfeld, expansion of the current system and relocation 2 km West in the Gonsenheim district. The third option was of course deemed the most feasible. In total the stadium budget was 55 million Euros plus a further 15 million used for the purchase of nearby land, unforeseen costs and the club held a “competitive dialogue” with all the company’s who tendered simultaneously in order to ensure the most suitable bidder won. The actual cost came in at around €60 million which is something the English FA could learn from! The site of the Coface Arena has been labelled as the “gateway to the city” due to it’s accessibility, and this was one of the factors which helped the club make their final decision on the location. The 34,000 capacity was nominated in 2012 for “The Stadium Business Award” which is testament to the quality of the finished Stadion. Coface Arena consists of four distinct sections with each stand invariably having a sponsorship name: Haupttribune (North), East Tribune, Orgentec Tribune (South) and Lotto Tribune (West). Away fans who visit Mainz’ Coface Arena are usually housed within the south-east corner within what the compass would describe as the eastern stand. 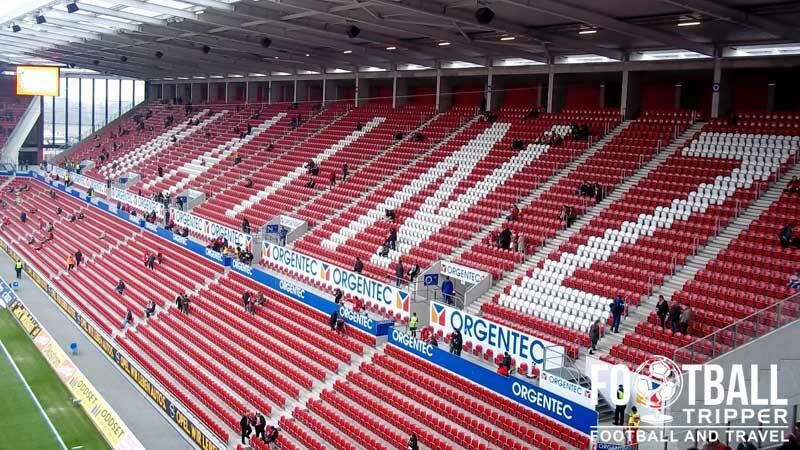 Although the standard allocation is for around half of this stand, occasionally the travelling supporters can occupy the entire stand depending on levels of demand and how generous Mainz are with their ticket allocation. Likewise with other parts of the ground, there are flawless views throughout the ground due to a lack of support beams for the roof. The ground is certainly unique in appearance with each stand having a distinct character. The fact that the flood flights are located on the roof’s themselves rather than in the corners on separate towers is also pretty cool in itself. Located out of town amongst agricultural land there really isn’t much choice when it comes to eating and drinking around the Coface Arena. The city centre has plenty of places to drink before and after the game including Porter House Irish Pub and Nero’s American Sportsbar. Within the ground catering is provided by Gauls Gmbh who have other 20 years of experience in serving grub to punters on matchdays. Employing over 400 members of staff, you can rest assured that your Pretzel isn’t too salty, that your burger is made with love and that your beers are never too warm or in short supply. Mainz 05 Operate run 1 fan shop at the stadium in addition to their official online store: Located along the main road which leads to the Stadium, this store supposedly has over 25 employees on match days and it is the best place check out merchandise of Mainz. 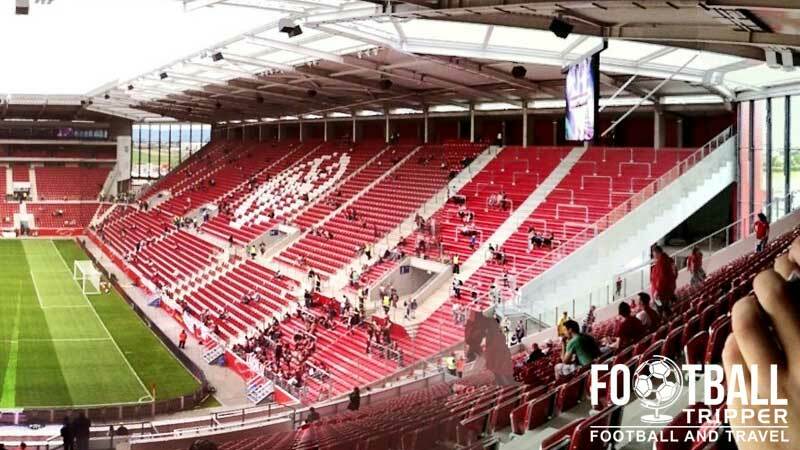 FSV Mainz offer fans the chance to undertake a 90 minute tour of the brand spanking new facilities at the Coface Arena. The tour covers everything from the players’ changing room to the VIP Boxes and from the Manager’s dugout to the press conference room. Tickets are an affordable €5.00 for adults, with concessions receiving a discount of 2 euros. The meeting point is next to the fan shops outside the underpass of the grandstand where it is housed. Tours generally speaking run every Friday at 5.00pm but you should always check the official Coface Arena Site for the most up to date information and to book your ticket. 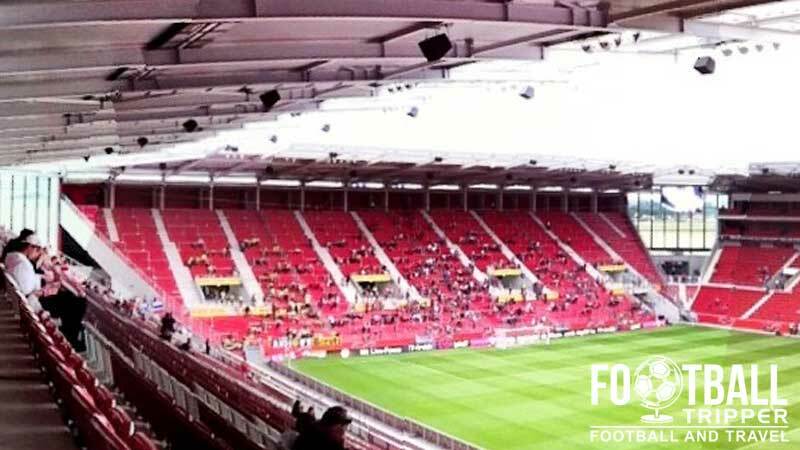 Tickets to see FSV Mainz 05 can either be purchased Online, via phone+49 (0) 6131 37550 0 or at the club store at the stadium and one of the other ticket resellers around the city such as the Tourist Office at Am Rathaus. The club sold out the majority of their home matches in the Coface Arena’s inaugural season but it seems interested has tempered slightly with most matches receiving a high attendance, but crucially not full. 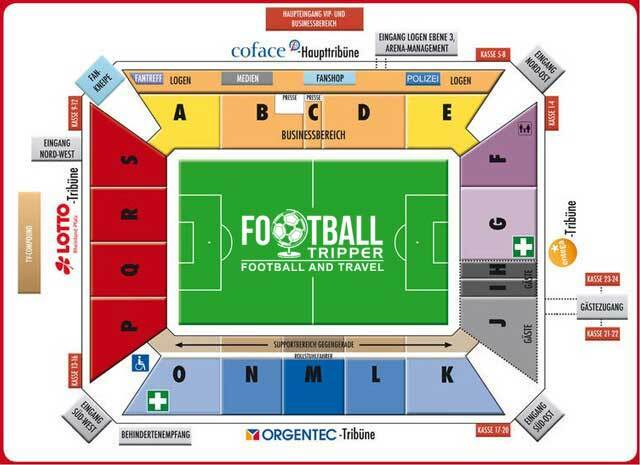 The cheapest tickets in the Coface Arena start from just €12.50 and are always within the terrace section, with a ticket behind the goal approximately €26.00 and something central likely to set you back €42.00. Add on anywhere between €5.00 – €10.00 euros if the big boys are coming to town for Category A matches. The Coface Arena is situated just over 2.7 kilometres west from Mainz historic city centre within an seemingly agricultural area. The green exterior of The Coface Arena, proper rural! As an out of town location, the Coface Arena is easy to drive from with the A60 motorway running both South and West from Mainz. There are numerous car parks located around the perimeter of the stadium costing just €3.50 for a space, and failing this you can always park at the nearby university as a back up. For a complete map of car-parks and further information Mainz 05 Parking Options. The bus is probably the easiest way to get to the Coface stadion on matchday with a special shuttle bus service operating directly from the main railway station (Hauptbahnhof). Normal services which can take you to the stadium include Bus 68 (Closest stop is Ackermannweg) and Bus 69 (Closest stop is Fachhochschule ). Mainz Haupbahnof – A proper railway station in that old continental Europe style. The main railway station of Mainz is the Hauptbahnhof and it is the busiest station in the Rhineland-Palatinate region with around 80,000 passengers served a day. Whilst there are good transport links to Europe and Germany, unfortunately there isn’t a direct service to the Coface Arena. The three tram lines of Mainz have been regarded as the backbone of the local public transport but in the case of getting to the football they really aren’t much help as they do not run near or to Mainz’ Stadion. The nearest International flight hub is Frankfurt Airport which is around 33 km East of Mainz City centre. Once you have landed and are ready to travel to Mainz you can catch the S8 train towards Wiesbaden which stops at Mainz-Hauptbahnhof (Main train station). This will take you around 30 minutes and the service runs at a rate of around twice per hour. Unless you want to sleep rough and illegally on a farm there aren’t really any accommodation options within the immediate vicinity of Coface Arena. There are some options North near to Mainz-Gonsenheim station such as Hotel Ludwigsbahn GmbH and Das Gästehäuschen but they are slightly redundant as you won’t be travelling to the stadium from there. Your best bet is to hop on the bus after the game back towards Mainz centre in the area between the River Rhein and Mainz Hbf (Main trainstation) and choose from the numerous hotels such as Hilton Mainz City, Hotel Königshof and the cool sounding Hotel Hammer Mainz Zentrum.